Maurice Thorez, theFrench Communist Party leader, also had the idea of an international force of volunteers to fight for the Republic. Joseph Stalinagreed and in September 1936 theComintern began organising the formation of International Brigades. An internatinal recruiting centre was set up in Paris and a training base at Albacete in Spain. Battali ons estblished included the Abraham Lincoln Battalion, British Battalion, Connolly Column, Dajakovich Battalion, Dimitrov Battalion, Mackenzie-Papineau Battalion, George Washington Battalion, Mickiewicz Battalion and Thaelmann Battalion. A total of 59,380 volunteers from fifty-five countries served during the Spanish Civil War. This included the following: French (10,000), German (5,000), Polish (5,000), Italian (3,350), American (2,800), British (2,000), Canadian (1,000), Yugoslavian (1,500), Czech (1,500), Canadian (1,000), Hungarian (1,000) and Scandinavian (1,000). These men were organized into the 11th, 12th, 13th, 14th and 15th of the Mixed Brigades. Men who fought with the Republican Army included George Orwell, André Marty, Christopher Caudwell, Jack Jones, Len Crome, Oliver Law, Tom Winteringham, Joe Garber, Lou Kenton, Bill Alexander, David Marshall, Alfred Sherman, William Aalto, Hans Amlie, Bill Bailey, Robert Merriman, Fred Copeman, Tom Murray, Steve Nelson, Walter Grant, Alvah Bessie, Joe Dallet, David Doran, John Gates, Harry Haywood, Oliver Law, Edwin Rolfe, Milton Wolff, Hans Beimler, Frank Ryan, Emilo Kléber, Ludwig Renn, Gustav Regler, Ralph Fox, Sam Wild and John Cornford. Women were active supporters of the International Brigades. A large number of women volunteered to serve in Medical Units in Spain during the war. This included Annie Murray, Thora Silverthorne, Salaria Kea, Mildred Rackley, Sylvia Townsend Warner, Mary Valentine Ackland, Lillian Urmston and Penny Phelps. Volunteers came from a variety of left-wing groups but the brigades were always led by Communists. This created problems with other Republican groups such as the Workers Party of Marxist Unification (POUM) and the Anarchists. The International Brigades played an important role in the defence of Madrid in November 1936. They also suffered heavy losses at Jarama (February 1937), Brunete (July, 1937), Teruel (December 1937) and Ebro (July-August 1938). 1936 to 1939: A military rising originating in Morocco, headed by General Francisco Franco, spreads rapidly all over the country, thus starting the Spanish Civil War. After a number of bloody battles in which fortunes changed from one side to the other, the ‘nacionales’ finally prevailed and made a victorious entry into Madrid (March 28th, 1939). 1936: The tragic death of Calvo Sotelo had the effect of accelerating a military coup that had been under preparation for a long time. Actually, the conspirators had been awaiting General Franco’s decision to begin the uprising. On July 18th it spread to other garrisons in metropolitan Spain and the following day Franco took command of the army in Morocco. The rising was succesful in Seville (directed by General Queipo de Llano), the Balearic Islands (General Goded), the Canary Islands and Morocco (Franco), Navarra (Mola), Burgos and Saragossa. General Yague advanced through Extremadura and Mola took Irun. By the end of 1936 the Nationalist troops controlled the greater part of Andalucia, Extremadura, Toledo, Avila, Segovia, Valladolid, Burgos, Leon, Galicia, a part of Asturias, Vitoria, San Sebastian, Navarra and Aragon, as well as the Canary and Balearic Islands with the exception of Menorca. Castilla la Nueva, Catalunya, Valencia, Murcia, Almeria, Gijon and Bilbao remained in Republican hands. The Republican government formed a coalition Cabinet headed by Giralt which was succeeded by another one under Largo Caballero. It brought the CNT (Confederacion Nacional de Trabajo, the anarcho-syndicalist union) into the Cabinet and moved to Valencia. 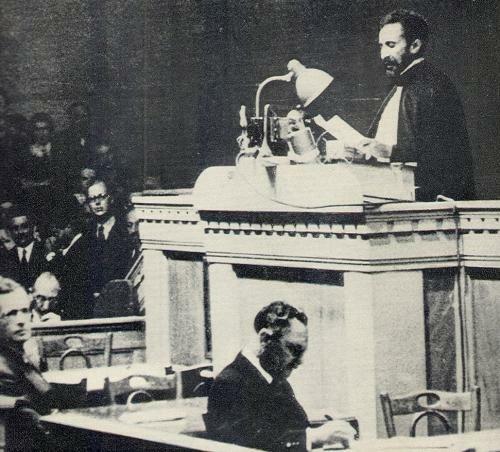 On September 29, the Junta de Defensa Nacional named Franco head of the government and commander of the armed forces. To offset these circumstances, the Republican government created a Popular army and militarized the militia. 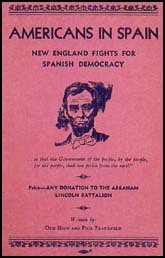 Both sides were soon receiving aid from abroad: the International Brigades were supporting Republican Spain and Italian and German troops, Nationalist Spain. 1937: The year 1937 was characterized by fighting in the north of the country: Guernica was bombed in April, Bilbao taken in June, Santander in August, and Gijon in October. The reaction of the Republicans was to open fronts in Guadalajara (March),Brunete (July), and Belchite (August). The Battle of Teruel was launched at the end of the year. 1938: The Nationalist transferred their efforts to Aragon, recovered Teruel and divided the Republican zone in two parts after entering Castellon in July 1938. The government replied with the so-called Battle of the Ebro (July-November 1938) which ended with a Republican defeat and 70,000 casualties. 1939: Once government resistance was exhausted, the Republican exile began with many Spaniards fleeing accross the border into France. Catalunya fell on February 10, 1939. Madrid was the only city still resisting, and the proposals of peace made by its Junta de Defensa (headed by Casado and Besteiro) were useless. Nationalist forces occupied the capital on March 28, 1939, and on April 1, General Franco officially ended the war. 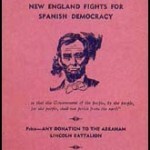 1936 February Popular Front won national elections and Azana was appointed president of Spain. March The right wing Falange Party was banned. March to May Street riots; strikes and general anarchy in some parts of Spain. July Military uprisings in Spanish Morocco and some parts of mainland Spain. The government dissolves the regular army. 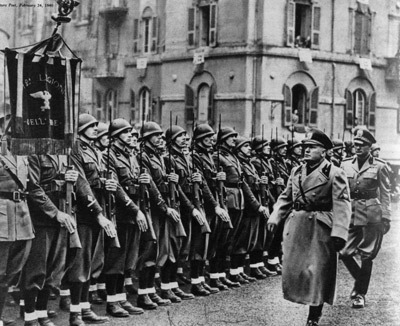 July 19th, Franco arrives to take command of the army in Morocco. Hitler agreed to help out the Nationalists. Stalin agreed to help the Republicans. German and Italian planes airlift Franco’s army to the Spanish mainland. August First International Brigade volunteers arrived in Spain. 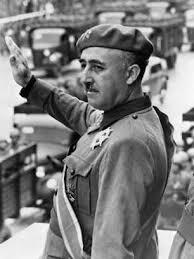 September A military junta named Franco as head of state and c-in-c of the armed forces of Spain. October The first aid from Russia arrives for the Republicans November Germany and Italy recognise Franco as head of Spain’s government. 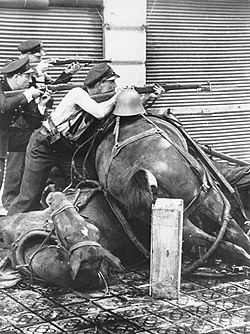 1937 February Nationalists started a major offensive against Madrid. International Brigade played an important part in resisting this offensive. March Battle of Guadalajara. Italian “volunteers” defeated. This led to Franco abandoning any attempt to take Madrid. April Guernica destroyed by aerial bombing. May Republican groups in Barcelona fell out causing serious weaknesses in the city. June The strategic city of Bilboa fell to the Nationalists. 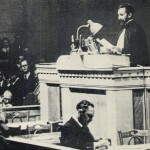 August The Vatican recognised Franco’s regime. 1938 April Republican Spain was split in two by the Nationalists. 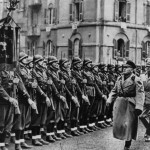 May Franco declared that the Republicans had to unconditionally surrender. July Start of the collapse of the Republican army after the Battle of the Ebro. October International Brigade left Spain. 1939 January Barcelona fell to Franco February Britain and France recognised the legitimacy of Franco’s government. March Madrid surrendered to Franco April Republicans surrendered unconditionally to Franco.